It was observed in 1930 that seminal plasma of a number of species contained very large amounts of substance(s) capable of altering uterine motility. 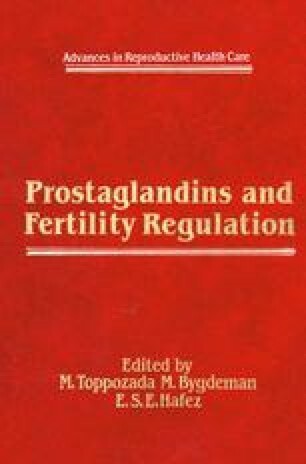 These substances were subsequently demonstrated to be prostaglandins (PGs); this began the early and continued association of this group of compounds with reproduction. The activity was found to be associated with a fraction containing lipid–soluble acids, derived from prostanoic acid. Restrictions imposed by obscure sources and small amounts of material available for testing were initially impediments to their study. However, after some time and considerable effort, a cooperative venture by The Upjohn Company and scientists at the Karolinska Institute resulted in the isolation of compound in pure form from sheep vesicular glands. The structures of PGE1 and PGFlα were subsequently determined (Bergstrom et al., 1968; Bergstrom and Sjovall, 1957). Larger amounts of materials were then prepared which enabled biologists to investigate their properties more extensively in a number of tests.